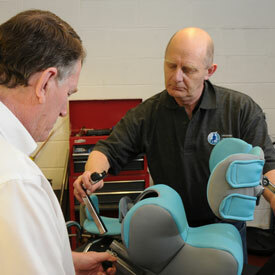 Specialised Orthotic Services are passionate about design. We are continually improving the quality and functionality of all our equipment. Through constant innovation we provide the best possible solutions for our clients needs. Research and development has been crucial to SOS’s success and is at the heart of our business. Solutions are developed through our team of staff and extensive trials with professionals, users and carers to ensure we refine our products to make them comfortable and practical to use. We extensively test and examine our products during the development process. This ensures robust performance and compliance with all relevant safety and quality standards. 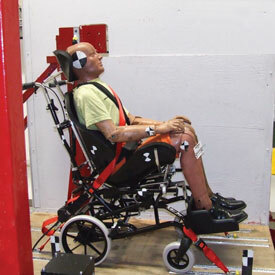 All wheel bases are tested to ISO 7176 part 19 and our seating systems have gained approval to ISO 16840 part 4. This enables SOS to provide a complete postural and mobility service to current transport regulations. All fabrics used are fire retardant and have high standards of durability. With an extensive range of colours and textures we are sure you will find the fabric to meet your requirements. We are committed to providing the most suitable systems for our clients and see our ‘testing’ program as a long term on-going process.